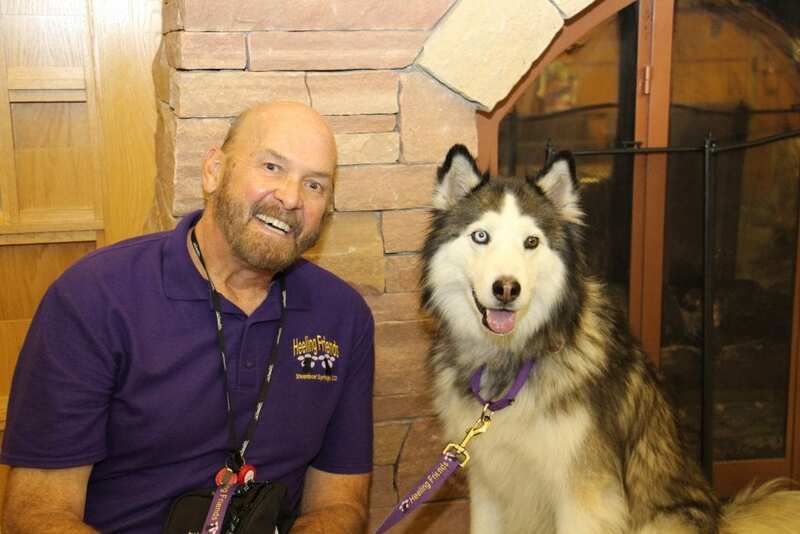 Bob Tomsky and his six-year-old husky, Anok, are one of the newer Heeling Friends teams to visit patients at UCHealth Yampa Valley Medical Center. Photo by UCHealth. Faithful companion. Man’s best friend. Or BFF – best furry friend, as Bob Tomsky refers to his 6-year-old husky, Anok (like a knock at the door). Little did Tomsky know, it would be a literal knock on the door that would inspire them to become another sort of team. Bob Tomsky and Anok – like a knock at the door – share a love for the outdoors. Photo courtesy of Bob Tomsky. 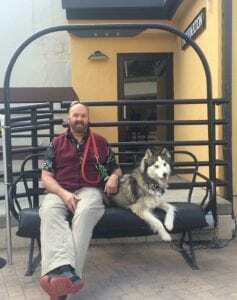 “Bobski,” as he’s known to many, spent 25-plus years with ski patrol and has been a ski instructor for more than 20 years. He loves the snow, being outdoors and interacting with people. It was late summer 2017 when Tomsky found himself at UCHealth Yampa Valley Medical Center due to an infection. Then Tomsky heard a knock. Tomsky said yes, and almost immediately, his outlook started to shift as Patrick and his dog, Harper, walked into the room. Tomsky received another visit from Heeling Friends during his inpatient stay. Following discharge from the hospital, Tomsky said Anok was a big part of his recovery. Their daily walks were an aspect of Tomsky’s therapy and gave Anok a chance to exert his energy. As Tomsky’s recovered and grew stronger, he reached out to Heeling Friends to see how he and Anok could become a team. Over a series of months, Tomsky and Anok completed the required trainings and test environments, including Anok being around wheelchairs, hospital equipment, temptations and new smells. Trainers watch for how well the animal responds to the handler and vice versa. Anok glances up at his owner, Bob Tomsky, during a visit to UCHealth SportsMed Clinic. Photo by UCHealth. Once they passed training, Bob and Anok received their coveted purple shirt and purple leash. “It’s amazing how the dogs know that when their human gets those two items out, it’s time to ‘work,’” said Weaver. And “work” they will. Tomsky and Anok can be found visiting patients and staff at YVMC almost weekly, bringing Tomsky’s initial interaction with Heeling Friends full circle.